I just did an experiment. I lent my 4-year old daughter Isabella a compact digital camera to see what would happen. I didn't supervise... just stayed in the office, nervously waiting for a crunching noise. I got a running commentary as she went around the house gleefully shooting whatever she wanted. ... and so it went on. And on. For 216 pictures. Here's her favourite “Because it shows Carmen's hand”. Isabella saw something precious in everything she could point the camera at. Us grown-ups only value the rare things as worthy of photos – the priceless view while on holiday in a remote spot, the wedding day kiss. I think we often forget to look for the priceless things around us everyday. I've put one of my favourite photos below... it's the old Tennyson power station in Brisbane (since demolished). I used to drive past it regularly, and saw it as a bit of an eyesore. Then one day I looked for a photo in it, and saw this. Canon EOS 5, Fuji Velvia, Canon 28-300 f/3.5-5.6L lens. Tripod, morning light. Trying to take an interesting photo of something forces you to look at it in a different way (perhaps a childish way) and to look for the beauty and the story in it. Try it. Before I looked for the photo in the power station, I could only only see broken windows and industrial mess. Frankly, I prefer the version of me that goes out looking for the beauty in things. It's a much more cheerful me too! It doesn't get out much – but having a camera in my hand helps. 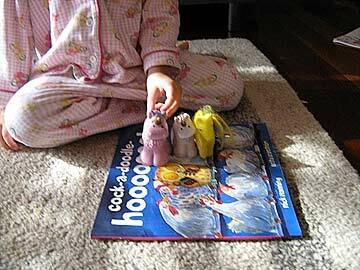 Isabella didn't have the technical skill to tell a story with her photos of her toys, but that's the easy part to learn. What she has heaps of – the thing that I want to bottle and keep – is way more important: a sense of fun and wide-eyed wonder with everything. If you'd like to know more about how children see the world with photos, have a look at this book: "I Wanna Take Me a Picture: Teaching Photography and Writing to Children", by Wendy Ewald. It's based around her experiences teaching photography to children all over the world. It's dated now (all based around film, not digital), but has some wonderful insights into how we learn to "read" pictures.